Coffee With Games: Rabbids went home? Rabbids find a new home! 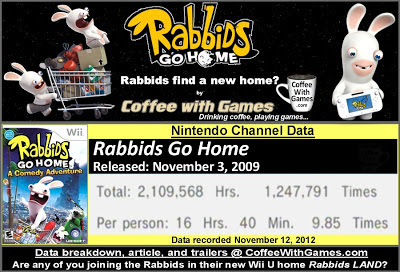 Rabbids Go Home data report. Rabbids went home? Rabbids find a new home! Rabbids Go Home data report. The Rabbids will be finding a new home this Sunday in North America, when the Wii U launches and they start invading the console through Rabbids LAND; but the Rabbids have had a home on the Wii for the last several years. Rabbids Go Home was released on November 3, 2009 for the Wii, at a MSRP of $49.99. It was the Rabbids' first comedy-adventure, according to Ubisoft, and players helped the Rabbids collect junk in their attempt to make a ladder of sorts, to the moon. The game was developed by Ubisoft Montpellier, and received an ESRB rating of "EVERYONE 10+" with "Cartoon Violence, Crude Humor, Mild Language, Mild Suggestive Themes, Tobacco Reference" listed as content for gamers and parents to be aware of. How many U.S. Wii owners have reported playing Rabbids Go Home, and how many hours have they reported trying to help the Rabbids get home? Brew yourself some coffee, and let's take a look! Data for U.S. Wii owners. Rabbids Go Home now has approximately 126,679 U.S. Wii owners that have reported playing the game, with 1,105 days possibly reported. The players have reported over two million total hours of gameplay, 2,109,568 hours to be exact, since the game released as the image above shows. The average play-time reported is 16 Hours 40 Minutes "Per person", and the average time spent playing the game per day/time is about 1 Hour 41 Minutes. How was the Rabbid's first comedy-adventure received by critics and customers? The game has a professional critic review score average of 79.02%, based on 33 reviews on GameRankings.com. It has a customer review score average of 71.37%, based on 51 reviews from Amazon.com. I did play Rabbids Go Home, but I didn't beat it. Back in January 2010, I started a game rental service through a local video game company that was open, Gamer Doc, and rented the game for about a week. School was just starting up and I didn't keep it long enough to beat though, but I checked my reported time with the game and put nearly 15 hours into it before returning it. Based on my play-time with it and the reported overall average "Per person" I guess I was closer to finishing it than I knew! If you have never seen what type of gameplay Rabbids Go Home provides, the trailer below should give you a decent idea. I enjoyed my time with the game, even though I didn't finish it. Being that I was (and am) a fan of the Raving Rabbids Wii games, I was glad to see Ubisoft try something new with the Rabbids outside of the mini-games/party games the Rabbids had become known for at the time. The Wii U is launching in just over 2 days, and Rabbids LAND is still on my short list of Wii U games to buy day one, because we enjoyed the Rabbids Wii games so much. If you haven't seen the a trailer for Rabbids LAND on the Wii U, the trailer below is one Bean 1 likes to play from the Nintendo Channel and will give you an idea of what to expect with the Rabbids using the Wii U GamePad. Did any of you play Rabbids Go Home, and help the Rabbids complete their mission to go home? Are any of you planning on joining the Rabbids when they invade their new Wii U home with Rabbids LAND?